Tax day is a day away and this time of year there are always questions about who pays how much in taxes. A recent poll by Pew Research Center found that “the feeling that some wealthy people don’t pay their fair share,” bothered 79 percent of respondents some or a lot. Recent analysis by the Joint Committee on Taxation shows that these respondents can rest easy. 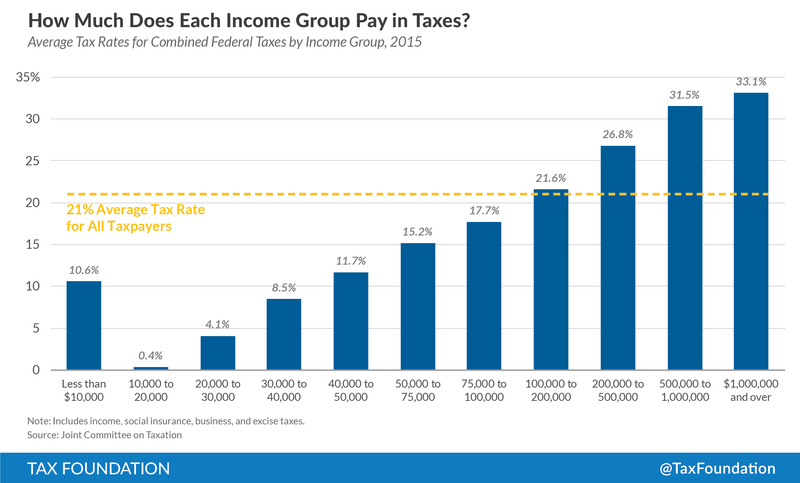 When it comes to individual income taxation in the United States, the average tax rate paid increases as we move up the income scale (chart below). As a group, taxpayers who make over $1,000,000 pay an average tax rate of 27.4 percent. At the bottom of the income scale, taxpayers who earn less than $10,000 pay an average tax rate of -7.1 percent, which means they receive money back from the government, in the form of refundable tax credits. The next income group up has an even lower negative tax rate at 11 percent. These results are as expected. 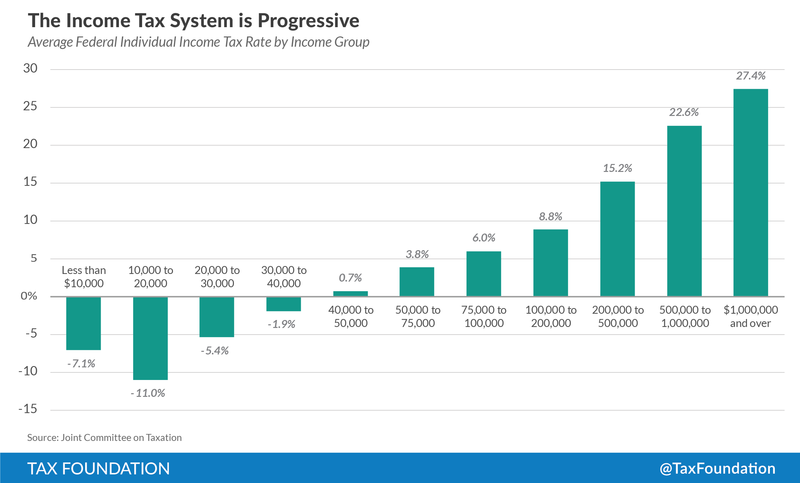 The U.S. income tax system is progressive, with marginal tax rates increasing as incomes increase and a large number of tax credits (refundable and nonrefundable) that limit the tax burden for lower incomes. Many would argue, however, that people pay more federal taxes that just individual income taxes. They are correct. People also pay social insurance taxes (for Social Security, Medicare, Unemployment Insurance, etc. ), business taxes, and excise taxes. But even when we consider these taxes, the tax code is still progressive. The Joint Committee on taxation report finds that the average combined marginal income and social insurance tax increases substantially as income increases. The average combined marginal tax rate is 7.7 percent for those who make under $10,000 and 44.6 percent for those who make over $1,000,000. Whether this level of progressivity is the correct amount requires a larger discussion, but it’s important to note that progressive taxes come with an economic cost. The evidence shows that progressive taxes limit economic growth. In a report from 2012, the OECD stated that moving away from progressive taxes would raise living standards. Our own economic model (TAG) finds that a cut in the top marginal income tax rate would boost the economy by 0.4 percent and that refundable tax credits have little impact on economic growth. When we determine the type of tax system we want to have and who should pay how much, we should evaluate these types of trade-offs with the greatest amount of information possible.